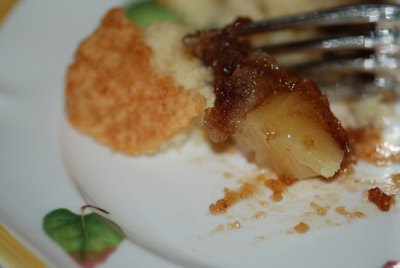 Once upon a time, in the faraway land called Matagalpa, my great-grandmother made an upside-down pineapple cake – or pineapple turnover, as she called it. This turnover was subsequently made by my grandmother, then my mother, and a few weeks ago, me. Everyone knows pineapple upside-down cake, but it’s not quite as chic as say, flourless chocolate cake. I suppose its out-of-a-can-pineapple topping and occasional studding with maraschino cherries is a little kitschy and June Cleaver-ish, but why not? Sometimes a piece of cake from memory lane is just the thing. This recipe calls for a cast iron skillet, but as my skillet is seasoned with bacon and beans, I used my tarte tatin pan, which is about 10 inches in diameter. If memory serves me, my mom has made this in a 9 x 13-inch pan. -To make batter, cream ½ stick of butter with white sugar. Mix in well with egg yolks. 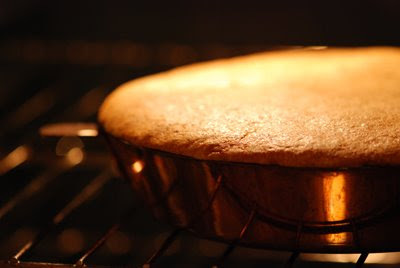 Sift together flour and baking powder, and add alternately with milk. Add vanilla. -Beat egg whites and fold in batter. Set aside. 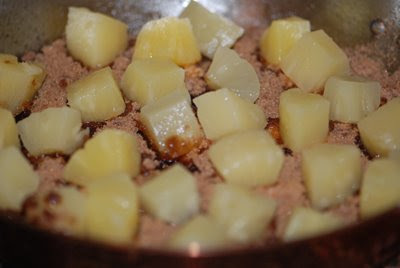 -In cast iron skillet, place ½ stick of butter in small dabs, and add brown sugar, pouring evenly over butter. Place 1 slice of pineapple in center of pan and other slices around, centering each with a cherry. Pour batter over this and bake in a slow oven, 300 degrees F. for 1 hour or until done. 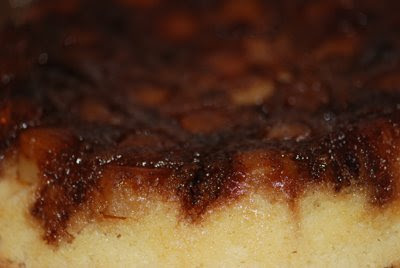 -Test by inserting toothpick in center of cake and when toothpick comes out clean it is done! I had leftover pineapple chunks and used them instead of rounds.